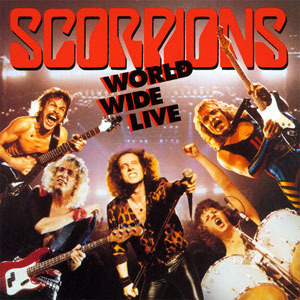 World Wide Live is a live album by German heavy metal band Scorpions released in 1985, produced by Dieter Dierks. It was originally released as a 2LP vinyl set, in a gatefold-sleeve, and a cassette. The liner notes contain a crew member list and the following tour date information and when the shows were recorded: Sports Arena, San Diego, CA, USA (4/26/84), The Forum, Los Angeles, CA, USA (4/24/84 & 4/25/84), Pacific Amphitheatre, Costa Mesa, CA, USA (4/28/84), Bercy, Paris, France (2/29/84), Sporthalle, Cologne, West Germany (11/17/84). The initial CD release featured 15 tracks (dropping "Another Piece Of Meat", "Six-String Sting" and "Can't Get Enough", parts 1 & 2.) The remastered CD features the original album in full.